The exact origin of the Old English Sheepdog is unknown; however, there are traces of its heritage in the western counties of England. Bred by farmers as fast and intelligent sheep and cattle herders to take animals to the market, their tales were docked for identification purposes. When sheering the sheep, farmers would often do the same to the Old English Sheepdog for blankets and warm clothing. Known also for herding deer due to its dense coat and cold-weather durability, the breed makes a great working and guard dog. In reality, the OES — nicknamed "Bobtail" because of his docked tail — is an easygoing, fun-loving, intelligent dog. He's a member of the American Kennel Club Herding Group. He's certainly a large dog at 60 to 100 pounds, but his profuse coat of blue-gray and white makes him appear even larger. Known for his wonderful temperament, he's powerful, sturdy, and hardworking. 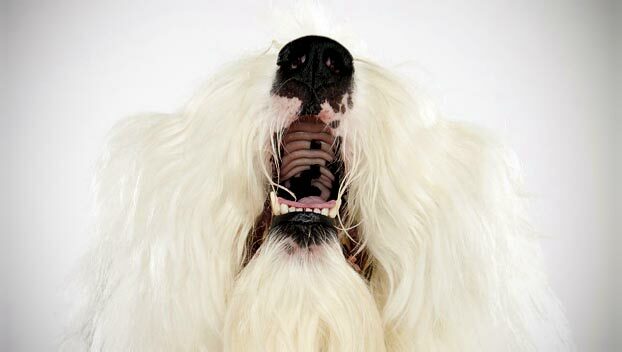 Training and proper socialization is essential for Old English Sheepdogs. They are large, bouncy and enthusiastic, but when they are young they can be especially rowdy. Patient, consistent training is must. Old English Sheepdogs are not for clean freaks. They tend to drool and are heavy shedders. Also, their heavy coats trap debris and dirt, which ends up on your furniture and floor. Originally bred for driving cattle and sheep, the OES is an active breed that requires a lot of exercise. 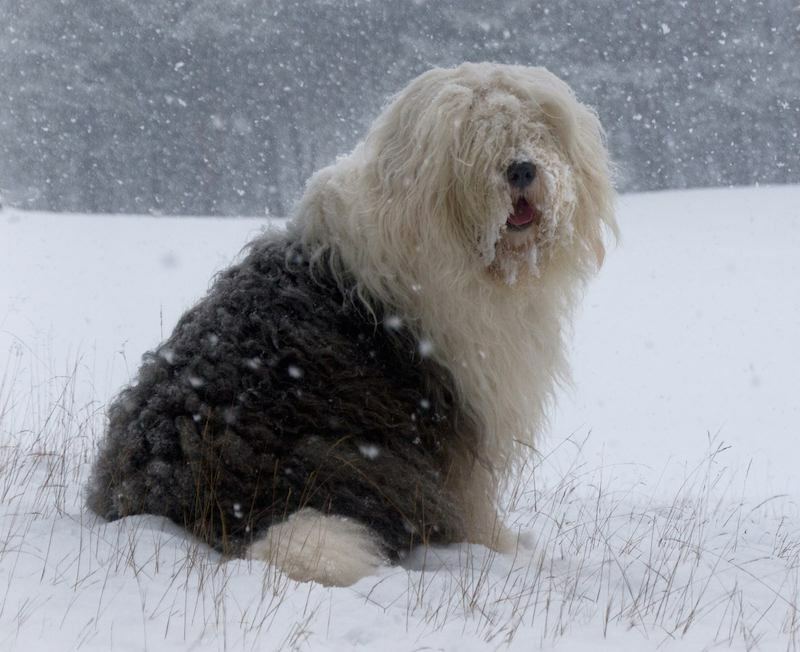 The Old English Sheepdog coat is high maintenance. Keeping it clean and tangle-free is time-consuming and expensive. Separation anxiety is common in Old English Sheepdogs. They live for their families, and they can become destructive if they're left alone too much. The Old English Sheepdog comes from the very old pastoral type dogs of England, but no records were kept of the dogs, and everything about the earliest types is guesswork. A small drop-eared dog seen in a 1771 painting by Gainsborough is believed by some to represent the early type of the Old English Sheepdog. In the early 19th century a bobtailed drovers dog, called the Smithfield or Cotswold Cor, was noticed in the southwestern counties of England and may have been an ancestor. 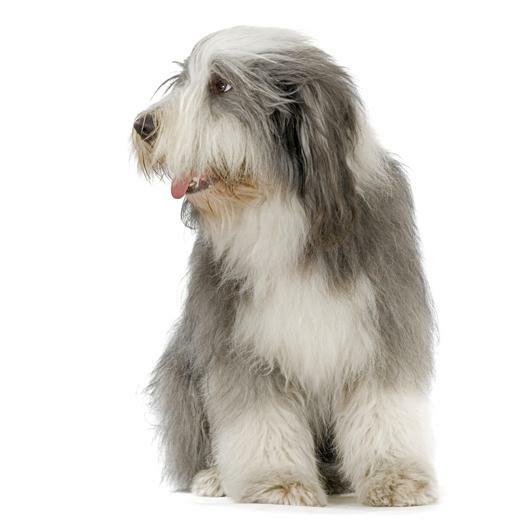 Most fanciers agree that the Bearded Collie was among the original stock used in developing today's breed. Some speculate that the Russian Owtchar was among the breed's ancestors. 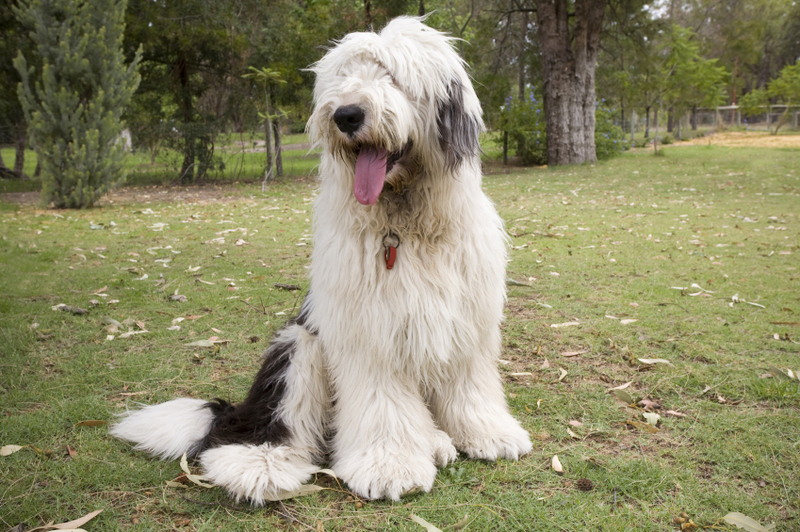 The Old English Sheepdog was at first called the "Shepherd's Dog" and was exhibited for the first time at a show in Birmingham, England, in 1873. There were only three entries, and the judge felt the quality of the dogs was so poor that he offered only a second placing. 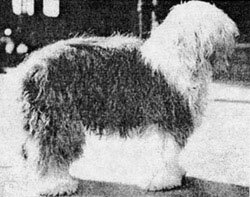 From that beginning, the breed became a popular show dog, and, although the shape of dog itself has changed very little over the years, elaborate grooming including backcombing and powdering the fur were recorded as early as 1907. The breed was exported to the United States in the 1880s, and by the turn of the 20th century, five of the ten wealthiest American families bred and showed the Old English Sheepdog. The breed continues to be a popular show dog today. The Old English Sheepdog is a playful, affectionate clown who delights in frolicking with his family and neighborhood children. In fact, adolescence in the OES often extends to about age three, and an adult OES will retain his playful demeanor well into his golden years. An intelligent breed, the OES is a quick learner, always looking for something interesting and fun to do. He's capable of performing numerous tasks, including herding, agility, obedience, and search and rescue. This breed requires significant physical and mental exercise. He doesn't enjoy being left alone for long periods of time and much prefers — in fact needs — to be in the company of his family. A properly bred OES is good-natured and kind, and this is what makes him an excellent children's companion and a super family dog. He's sometimes called a nanny, a term of endearment that arises from stories surrounding the role he sometimes takes on within his family. However, the OES is not known for being an assertive watchdog. He may bark when strangers come to his home — or he may not. Some OESs are highly protective, while others aren't. As with many assertive and sometimes strong-willed breeds, the training will be crucial. Old English Sheepdogs come from a clear hierarchy both in dog packs and in the farming structure in western England, which means they need to feel like they have a place within your home’s own hierarchy. Good training, setting boundaries, and even giving your Old English Sheepdog a job to perform are all good ways of establishing this hierarchy. A particularly weak-willed owner can sometimes find the Old English Sheepdog to be a handful, especially as the dog gets older and becomes more set in its ways. Apartment dwellers may be drawn to this breed because they have a reputation for being well-behaved indoors but Old English Sheepdogs are not city dwellers and should not be kept in apartments or condos. They are country dogs, who do best in the suburbs or on a farm where they can herd livestock. 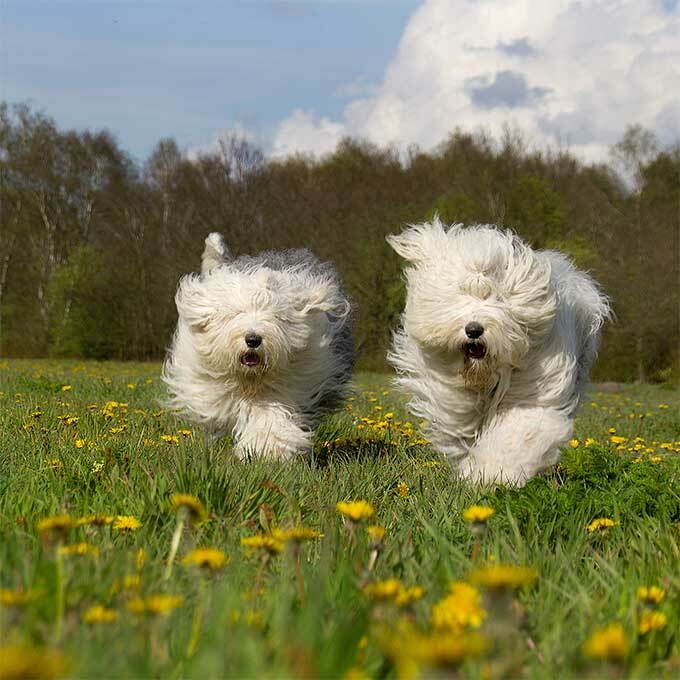 At least one hour of vigorous activity per day is required for Sheepdogs to maintain health, happiness and an even temperament. Sheepdogs make excellent walking, jogging, biking and hiking companions and should be included in these activities. 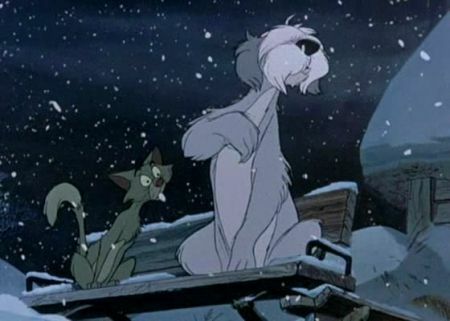 Their heavy coats can make them prone to overheating, so most owners keep their long coats cropped short. The well-bred and well-socialized Old English Sheepdog is a trustworthy children's companion. Some say he will supervise and herd young children, keeping them in a particular area. Others say the OES acts as a means of support to the toddler learning to walk. Unfortunately, there are some exceptions to the Old English Sheepdog's role as a loving nanny, due to poor breeding that has resulted in ill-tempered and neurotic dogs. Buy only from a reputable breeder and ask to meet the puppy's parents. And it is extremely important to note that children should never be left unsupervised with any dog, regardless of breed or temperament. The good-natured OES is friendly with other dogs and pets, provided he is properly socialized and trained. 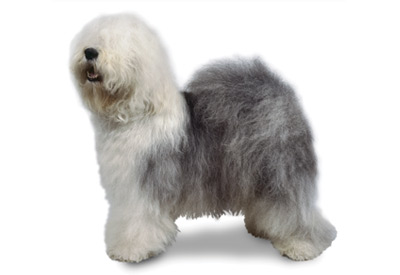 Friendly and active, the Old English Sheepdog is a lover of family and children. A gentle and loyal breed, it requires training to avoid herding humans. A natural-born worker, it does best when it has a job to do. Since it is active indoors, the breed needs a large yard to roam in and may not be satisfied with apartment living. Requiring a sufficient amount of exercise and an owner with strong leadership, the Old English Sheepdog can easily become distracted and troublesome. In need of brushing and regular grooming, the dog is not considered to be a large shedder. Elwood in The Shaggy D.A. 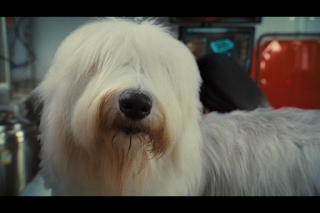 Martha, Paul McCartney's Old English Sheepdog was said to be the namesake of Martha My Dear. 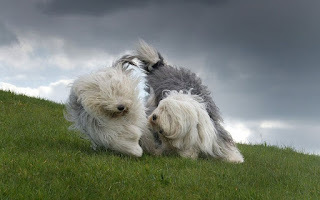 The Old English Sheepdog loves to be around its family members. Waking up surrounded by children and other people, it will happily greet each with a smile. Running outside for a bit, it'll guard the home as its number-one priority. Coming inside for a bit of play, this breed will be ready and waiting for its daily run. After its daily brushing, the Old English Sheepdog will engage in a game of fetch before snoozing at the foot of its favorite owner.